Terms: Ticketing company Veritix has acquired a $100-million credit facility from Rockbridge Growth Equity, an investment firm owned by Veritix and Cleveland Cavaliers owner Dan Gilbert. The deal gives Veritix access to capital and the ability to offer upfront rebate deals and cash payments to teams, venues and entertainment properties. Kline said many clients are still asking for cash payments in advance of future ticketing contracts. “Those days are not over – our deals financially are very lucrative for venues and teams, but the reality is that when we’re competing head to head, these large cash advances have been common practice and in some cases it’s expected and even required. Deal: Five years with a five-year renewal option, percentage-of-the-gross contract. There is no investment on Centerplate’s part. 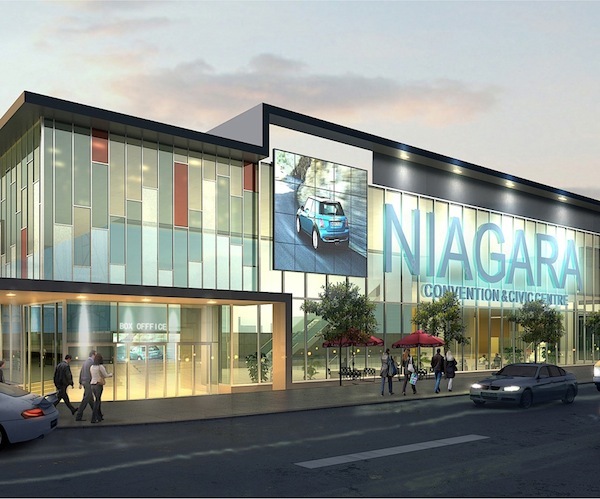 Comments: Green was the color of the game when the private management company for the venue, Niagara Convention & Civic Centre selected Centerplate, said Kerry Painter, venue president and general manager. “Centerplate has a strong presence in the convention center industry and recognizes the needs of our conventioneers,” she said. But most importantly, they grasped the culture of Niagara and the emphasis on green and locally grown. In fact, the convention center will have a Kitchen Garden located across the street on land donated by the monastery there. It will be designed by the university, which is combining its horticulture students with chef, kitchen and culinary students to come up with a kitchen garden that is sustainable. Centerplate jumped on the idea, and enhanced it with its own programs, such as buying meat and produce within a 100-mile radius as much as possible and working with the 90 local wineries, she said. The 280,000 sq. ft., $100 million convention center will open April 8, 2011, Painter said. It also includes a 1,000-seat theater. Centerplate will staff a cafe, a permanent concessions stand and lots of portables. In the last six months, Painter has contracted most of the services, including AVW Telus for audio visual; Showtech for electric; and Strongco as decorator. On her list of outstanding items is a security firm. She hopes to have one on board in the next two or three months. Deal: Five years. Veritix will provide the backend platform for GetTix.net, a full service provider. Comments: Veritix replaced Paciolan. Charlotte Allison, vice president of business development for GetTix.net, cited flexibility, including pick-a-seat rather than best-available technology, which flows over not only online but to kiosks, using the same type of environment, as reasons the company chose Veritix. “We actually have several clients interested in coming with GetTix and that was one element they wanted,” she said. Veritix President Jeff Kline said the regional ticketing business has been good to his company. Last year, the firm inked a deal with ArtTix, a Salt Lake City firm that powers the Utah Jazz basketball team. GetTix was founded in 2004 as an arm of Global Entertainment Corp. (GEC), a public company, which also manages venues under its Encore Facility Management arm; sells sponsorships (GEMS-Global Entertainment Marketing Systems); owns the Western Professional Hockey League, dba CHL (Central Hockey League); operates a construction arm, ICC (International Coliseums Company), and a food service, GEC Food Service, LLC. Allison was brought in a year ago to secure additional ticketing contracts outside of Encore-managed buildings. GetTix has contracts with Encore-managed Allen (Texas) Events Center; Independence (Mo.) Center; and Tim’s Toyota Center, Prescott Valley, Ariz. They will also handle the Dodge City Events Center when it comes on line in February 2011. “We use the building as a hub and develop around that market. You build it as you go,” Allison said. The newest client for GetTix.net is Brand.Live, a marketing firm out of Vancouver, B.C., which produces festivals. The new alliance brings Veritix its first international client, Allison said. TicketSummit’s keynote panel included (from left) Jeff Kline of Veritix, Doug Lyons of Tickets.com and Don Vaccaro of TicketNetwork. 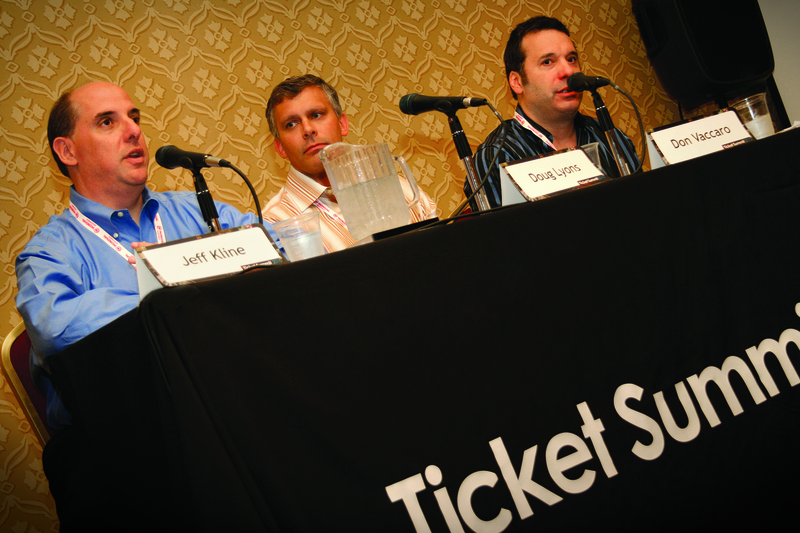 REPORTING FROM LAS VEGAS — In its fifth year, Ticket Summit enjoyed a record attendance over its recent three-day run, with more teams, primary ticketing companies and ticket brokers participating than ever before. Attendance was estimated at just over 600 with a trade show that hosted nearly 25 exhibitors. The success of the July 14-16 conference was in contrast to the difficult market conditions facing the hundreds of ticket brokers in attendance. Tickets continue to sell below face value for many concerts, consumers continue to wait until the last minute in hopes of snatching up discounted offers and acts that were once guaranteed to sell out arenas are now cancelling concerts because of slow ticket sales. Coinciding with the conference was an investor call by Live Nation Entertainment that helped set the nervous mood at the conference. CEO Michael Rapino and Chairman Irving Azoff warned investors that ticket sales were down 10 percent for the top 100 tours during the first half of the year, and forecasted a 15 percent drop for the second half of the year. The announcement inadvertently prompted a sell off of the Live Nation stock and a two-day, 22-percent drop in price, the largest for both days on the New York Stock Exchange. Since the Justice Department approved the merger between Live Nation and Ticketmaster, the business development market has opened back up. Paciolan, which was spun off to Comcast-Spectacor, has re-signed over a dozen clients in the past 60 days, while Cleveland-based Veritix has inked deals with the Final Four and Frozen Four. “For the longest time during the merger talks, the sales pipeline froze because everyone took a wait-and-see attitude. Now that the merger has been announced, everyone is looking at next steps,” said Jeff Kline, president of Veritix. Kline said his company is trying to leverage its technology and Flash Seats platform against Live Nation’s ability to bring content and concerts to potential client facilities. “It’s easy on their part to use content as a unique sales proposition,” said Kline, adding that many facilities have expressed a fear that if they sign with anyone besides Live Nation, they’ll lose concerts. While the merged company is not allowed to retaliate against facilities that go with Tickets.com or Veritix, they are allowed to bundle content deals into their agreements. “It’s a very subtle and important difference,” Kline said. Doug Lyons, newly promoted VP of Product Marketing & Strategy for Tickets.com, said the other competitive tactic Live Nation attempts to use to corner the marketplace is upfront payments, often worth millions of dollars, in exchange for ticketing contracts. But not all technology is treated equally. It was Ticketmaster which introduced a paperless ticketing system for a number of concerts over the past 18 months that sought to close out brokers by making concert tickets non-transferable. The practice was outlawed in the state of New York after intense lobbying efforts by companies that included TicketNetwork and eBay. The state of New York has adopted the first law attempting to regulate the growing paperless ticket market. On July 2, New York Governor David Patterson signed the bill, limiting the ability of ticketing companies and producers to force consumers to use paperless tickets. The law essentially blocks a growing practice by Live Nation and its ticketing system Ticketmaster of blocking fans from reselling and even transferring tickets to high demand events. Under Ticketmaster’s present paperless system, only the original buyer of the ticket can redeem the ticket at the door using the credit card used in the purchase. The law also provided an extension to New York’s ticket resale law, which had expired in June and had temporarily made ticket resale illegal. It also banned the use of computerized bots to purchase tickets. The law is a win for ticket brokers and resale platforms like StubHub, which had lobbied hard to fight paperless technology as anti competitive and anti-consumer. “The new law passing in New York is a great win for consumers, as it allows for a truly open marketplace,” said StubHub spokesperson Joellen Ferrer. During a June 2 hearing on the bill, a number of sports executives testified about the impact of paperless tickets and several state senators indicated they were considering an outright ban on paperless tickets. “We believe in and we support transferability,” testified Randy Levine, president of the New York Yankees. He argued that the technology is too new and that the state legislature shouldn’t yet put restrictions on paperless tickets until it was better understood. Lhota said banning paperless ticketing will weaken the ability of artists to sell directly to fans and push concerts into other states. “Paperless ticketing technology is evolving, and rather than ban or limit its growth in New York,” legislators should “pass legislation that will be flexible enough to create a transferable paperless option,” Lhota said. The losers in the deal are ticketing companies like Ticketmaster, which had sought to corral the high prices associated with ticket resale, as well as artists and agents who wanted to limit the number of tickets that end up in the hands of scalpers. Live Nation’s Investor Relations Spokesperson Linda Bandov said the company would not comment on the resale law. Veritix also maintains a paperless ticketing system, although its system likely will comply with the law because under most circumstances, the platform allows for both paperless and traditional fulfillment of tickets (there are some events, like student ticketing for the Final Four, where only electronic tickets are issued). Kline also said that paperless tickets are often misunderstood by lawmakers. Jeff Kline, the Future King of Colleges? Cleveland-based ticketing company Veritix has signed one of its most high profile clients to date, bringing the National Collegiate Athletic Association into the fold with a deal to represent all championship events. The deal solidifies Veritix’s presence at the popular March Madness tournament and sets in motion plans to secure a number of other top rated college events. Venues Today recently caught up with Veritix President Jeff Kline to discuss the agreement. Does this cover all NCAA championship games? It’s for select NCAA championships because some will roll into our agreement as their current agreement with their provider expires, like the College World Series. We’ll be doing the Final Four this year in Houston, but some of the regional games will continue to be honored with different providers. The intent is for all NCAA Championships to roll into the agreement, which we’re thrilled about. Does that include the Bowl Championship Series for NCAA football? No, those are separate. The Final Four and the Frozen Four are included, and we’re in discussion right now for the College World Series, which has some time left on the existing agreement. We’ll also be doing archery, badminton and soccer plus a number of additional events. How is Flash Seats going to be implemented in this agreement? Will it be a similar experience to purchasing tickets to a Rockets or Cavs game? No. The agreement we have in place includes three components. Component number one is that we will be the exclusive ticketing provider for the select event. Part two is that the NCAA will use our platform to take reservations for subsequent championships, and then fulfill the orders. The third part of our agreement calls for the continued use of Flash Seats for student ticketing, like we have done for the last three years. Will Flash Seats be used for resale? No. We’ll provide the digital technology for the student sections where transfer and resale is not allowed. And the tickets will be tied to their student ID cards? Will you be active in trying to stop resale at the Final Four? That’s really got to come from the NCAA. They have their own policies in place and we have the platform and technology to help them do that if they choose to do so. They have a current agreement in place with Razorgator to provide secondary tickets. How was this deal reached? It started two years ago at the Final Four in Detroit when the NCAA came to us, looking for an alternative platform for student ticketing. Not only is it meant to sit atop any primary ticketing system, it’s also portable. You can take a few routers and scanners and be set up. It worked so well that during this year’s Final Four in Indianapolis we repeated what we did the previous year. We went to a venue that had another ticketing company as their primary provider, we set up Flash Seats for student tickets, and emailed the buyers. Tickets were associated with their unique ID and they were able to gain access to the venue. Plus we knew who each student was because they couldn’t transfer their tickets. That gave the NCAA exposure to our company, and when they sent out an RFP last year, we responded and were awarded the business. It’s a very prestigious client. Is this your first entrance into the college market? No, we have Boise State on our client list. We also sell tickets for Texas A&M and Oral Roberts University. We are thrilled that we were selected and this opens the doors for us to have more opportunity in the collegiate space. That part of the market seems to have a lot of opportunity. Paciolan just announced that it has re-signed 10 clients in the past 60 days. What is Veritix’s strategy going forward? We see it as a definite opportunity for us. We’re in the collegiate space and it’s no secret that we don’t have as many collegiate clients as Paciolan, but there are plenty of challenges and opportunities. It’s been about six months since the Department of Justice handed down the consent decree, essentially forcing Ticketmaster to spin off Paciolan to Comcast-Spectacor and license its software to AEG. The obvious goal of this agreement was to make the ticketing space more competitive. Has it worked?